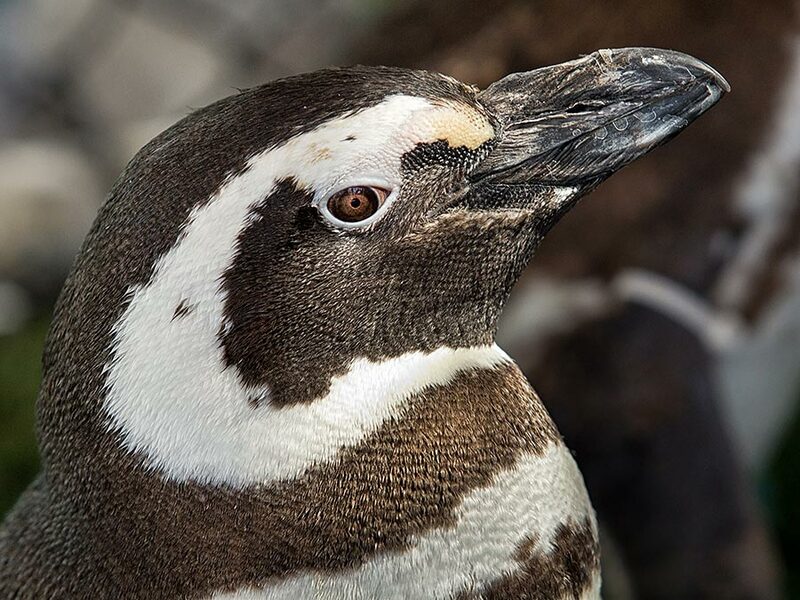 The Aquarium of the Pacific actively participates in the Association of Zoos and Aquarium’s (AZA) Magellanic Penguin Species Survival Plan (SSP). When the June Keyes Penguin Habitat opened in 2012 the acquisition of all of the birds was coordinated through the SSP, with some birds coming from other AZA accredited facilities. Five birds, however, were rescued after they were found stranded on a beach in Brazil. Magellanic Penguins are typically found near the southern tip of South America on the coasts of Chile and Argentina, where they feed on small fish such as sardines and anchovies. Hundreds of these penguins were found stranded in Brazil in 2011. Most likely a result of climate change, the penguins’ food sources are changing and they must travel farther in search of food. After rescue, some of these birds were strong enough to return to the wild while others, including the five we received, were deemed unreleasable because of health issues. All five are now thriving in our exhibit and have even produced chicks. Magellanic Penguins are listed internationally as near threatened. Species Survival Program participants agree to cooperate with each other by sharing animals for breeding purposes based on various genetic criteria.In support of these efforts the Aquarium has exchanged penguins with other AZA accredited facilities, and as our colony continues to grow through successful breeding, we anticipate even more such sharing to occur in the future. As an accredited member of the Association of Zoos and Aquariums (AZA), the Aquarium of the Pacific is an active supporter of AZA’s Species Survival Programs (SSP). These programs are cooperative efforts by AZA member institutions to manage specific and typically threatened or endangered species populations. Efforts include cooperative breeding programs aimed at increasing genetic diversity among the entire zoo and aquarium populations and various field conservation programs. The Aquarium of the Pacific has several animal species for which AZA has established SSPs including Guam Micronesian Kingfishers that are extinct in the wild, Magellanic Penguins listed internationally as near threatened, and southern sea otters listed internationally as endangered and as threatened by the U.S. Fish and Wildlife Service.